Differentiating your blog from the multitude of competitors can only be achieved by managing quality content effectively for captivating viewer interest. Videos fall under the most interactive of content categories, where just a few seconds can express an enormous quantity of content covering multiple categories. One of the main reasons visitors abandon videos while viewing is that it deviates from the original topic. Create videos which are concise yet to the point to maintain viewer interest on the topic. Rather than condensing various topics in a single video, develop multiple videos of short duration (preferably under 2 minutes) for enhancing viewer understandability regarding content. Rather than presenting videos in landscape view, opt for the square format as it can be viewed on a desktop, mobile and other devices without changing the dimensions. Shifting to square view for videos can boost engagement by 80 to 100% since it facilitates users of different platforms to view your videos without compromising quality. While textual content provides viewers with the information they desire, creating videos which summarize it in under 2 minutes delivers the required information efficiently and attains maximum engagement. Alternatively, optimize your blog to primarily post videos as they can easily be shared on YouTube and other social media platforms for increasing traffic to blog. Choosing an intermediate blogging format where content is supplemented by videos covering what the blog features satisfy multiple viewer categories and maintains their interest. Blogs which accompany posts with videos generate 3 times more inbound links compared to simple ones. While all blogs feature an introductory page featuring an overview, converting the textual content into a well-structured video condenses the information into a form which is both engaging and interactive for viewing. Creating a story allows the viewers to become a part of what the blog presents and motivates them to view and return to the blog for updates. Viewer engagement and retention can be significantly increased by compelling them to become part of your story through content personalization, which suits their interests and attracts them towards blog videos. An introductory video on the main page has a 53% chance to secure a position on the first page of SERPs as compared to blogs in the similar niche. Blog posts are among the top sources for DIY videos which are both highly viewed and can be developed for any content blogs can possibly cover. DIYs are perfect for resolving user queries with their step by step, a procedural instruction which can be followed by users right down to the intricate details. These DIY videos can include home furniture remedies, electrical hacks, makeshifts, instructional videos on IT learning, coding and web development etc. Since 65% of internet users rely on the visual representation of data for their learning process, DIYs promise a high level of engagement by covering the entire process for resolving queries. Moreover, they are incredibly easy to develop as a result of screencasting tools and editorial applications, meaning they can be developed even under resource constraints. Another technique for greater traffic and engagement is featuring live videos on your blog. Live videos can be streamed on social media platforms to ensure maximum users are aware your blog is now going live. Viewers are immediately attracted towards live videos as they are fresh, previously unviewed content and a trending item. By sharing links for live videos on other websites and blogs, viewers on secondary sites can be alerted and redirect to your blog. Moreover, live videos encourage viewers for repeat visits on blogs, ensuring long-term engagement. Creating video content for your blog is among the most successful techniques for enhancing engagement but it does not mean it should feature only such videos. Provide videos which will be useful in answering viewer queries and develop engagement by appealing to the audience on a personal level. Choose videos created by other content developers which match blog topics to fill the requirements for video content without having to expend resources for producing them specifically. If the viewers deem the videos to be captivating and providing helpful solutions, they will continue to browse the remainder of content on the blog, thus contributing towards higher engagement. To determine whether the videos are highly rated or will deliver the required content, blog visitors will turn towards reviews. Adding reviews about videos provides visitors with testimonials that the content is relevant and helpful, which encourages engagement and retention. Reviews are also a great source for identifying how the video content can be improved and what the viewers are searching for. Almost 50 percent potential buyers browse video reviews for information before confirming their purchase of products or services. Reviews from other users are trusted by potential customers since they can dispense valuable information from their perspective and are absent of promotional intent. Adding such video reviews engages customers to further research on their choice and can also be directed towards related videos. In case a lengthy topic requires video coverage, create multiple related videos to feature its content on your blog. Breaking the content into smaller topics provides prospects for improving video presentation and enhances understandability for viewers, which in turn captivates their interest. The viewer interest is not lost from viewing a single video covering the entire post and provides them with the option to select from the topics of their interest available in the related videos which optimizes their time. A short title under 50 characters to captivate user interest. Keywords included in video tags and title for increasing visibility on search engines. Video thumbnail which matches the content the video presents. Create video playlist which contains other videos hosted on the blog. Targeting all available platforms for promoting your videos is necessary for achieving engagement from a maximum number of viewers. 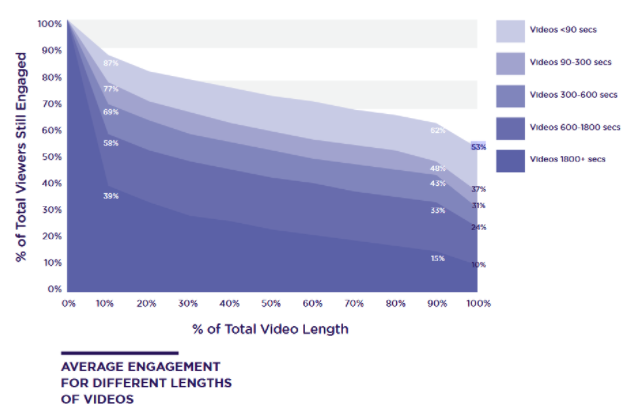 The method by which video is being shared directly affects engagement since the deciding factors differ from one platform to the other. Metrics are an effective reference for determining how the videos must be shared to achieve high user acceptance rate. Modifying the videos being displayed on your blog to suit viewers can lead to 35 percent higher retention. If the content has been personalized for the target audience, they will watch the video until the very end and will browse the blog for additional content. Viewers can be sent emails with links to videos which match with their browsing history on the blog for recommending videos which will further attract their attention and increase chances of returning to the blog. With the advances in technology, wireless internet and mobile hardware platforms have enabled the true potential of videos. Over 74% of online traffic is now comprised of videos, which highlights their significance and impact on websites. By following these 13 techniques for boosting engagement, your blog will generate greater traffic and higher retention rates to encourage viewers for repeat visits. This article was written by TapChief Expert, Asad Ali and was first published here. Asad is an internet marketing expert for almost 7 years and is currently working at GO-Gulf – a Dubai based custom website development company. You can schedule a call with him on TapChief here.